Probably more than any person should. Any time the choice of corn or flour tortillas presents itself to me, flour tortillas win by a landslide. Growing up my mom used to make us homemade flour tortillas, and let me tell you, store bought can’t even hold a candle to homemade. They are SO much better! She has misplaced the recipe, but told me this particular one from The Cafe Sucre Farine comes pretty close to hers. It is absolutely AMAZING! I highly suggest you give it a try! With 5 basic ingredients and a simple method, this recipe is virtually fool-proof! In bowl of stand mixer, add flour, salt and baking powder and whisk until well combined. Add water and oil and mix for 1 minute, scraping down the sides. After ball of dough is formed, mix for one more additional minute until dough is smooth. Place dough on a floured surface and divide dough into 16 equal pieces. Roll each piece into a ball and place each ball into one large ziplock bag and seal shut. All the balls in the same large ziplock. Let them rest for 15 minutes. While dough is resting, preheat griddle to medium-high heat. After dough has rested 15 minutes, remove one at a time and roll each ball into a 6-7 inch round disk. Repeat for each dough ball. Cook each tortilla one side a time. Cook the first side for about 45-60 seconds unit bottom has a few pale brown spots. Flip and cook remaining side for 15-30 second on second side. Stack tortillas and wrap tortillas in a towel to cool. Store in a zip lock bag or other air tight container if not eating right away. Did you mean 45-60 seconds? Do you put any oil in the skillet and if so, how much? I let my 12 yr old make these today and they turned out great. A good, easy recipe. We went on to make tuna quesadillas. The tortillas were great. Thanks for the recipe. I use this recipe and have never used 1 zip lock bag. I just divide my dough, place on a lightly greased plate and cover with a clean damp towel. You sold me on this - can't wait to try out the recipe! I made your homemade flour tortillas today and used them to make Creamy Enchiladas. They were excellent! My husband even had a second helping, which he never does. What would be the best way to make this without a stand up mixer? 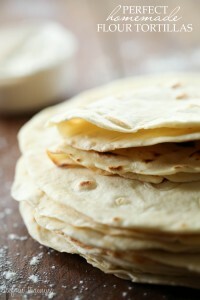 My husband is Mexican and would probably flip a lid if I could make tortillas.... no matter what kind! And since I have been trying to learn some Mexican food stuffs and cooking why not tortillas! hi, can you refrigerate or freeze the tortillas before cooking? So much better than store bought. You can use any kind of bowl as long as it's big enough to give you room to knead the flour around. I prefer shortening. Knead a ball then take it out of the bowl to give you room to finish kneading the rest of flour. Then put ball of dough back together and knead it real good. Use warm water as warm as you can stand it. You can cover it up with a damp cloth and it give you the same results as the baggies. The reason for covering is it will form a crusty layer if left out uncovered too on long. G luck it's all worth it. This was the most easy and simple recipe to follow. Very light tasting so if you want a bang add some herbs to the bread mix, like Rosemary. I cut this in a 1/3 and it works out perfect for making 4 tortillas. Turned out fabulous! Tasted great and stayed soft. Dough is easy to work with and cooks up fast. I tried these again using 2 cups unbleached AP flour + 1 cup freshly ground wheat flour, decreasing the oil from 1/3 to 1/4 cup, and decreasing the water from 1 cup to about 7/8 cup. (For the water, I measured out a cup, but only added as needed and ended up not using all of it.) They turned out just as good as the original recipe, but the balls of dough didn't get an oil slick on the outside after resting for more than 15 minutes (which outcome the original recipe yielded). Just want to say that there is no such a thing as tuna quesadillas in Mexico! And enchiladas are made with corn tortillas, not flour tortillas. That's ok that Mexico doesn't have Tuna quesadillas. The great thing about cooking is its only limited by ones imagination. It's all about personal preferences. The fact that the 12 year old is participating in the kitchen is AWESOME!